I’ve started reading a book entitled The Northbound Train written by Karl Abrecht. No, it’s not a fiction novel. It’s not even a “Christian book” (funny that some believers refer to books related to God or the Bible as “Christian,” as if they, too, are converts!). 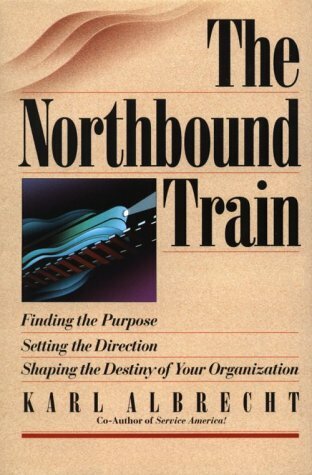 The Northbound Train is a book about leadership. Its subtitle summarizes what it is about: Finding the Purpose, Setting the Direction, Shaping the Destiny of Your Organization. Thinking along this line as CSO (Chief Servant, OK?) of a fledgling and yet to be organized movement we call Saints in Sin City, I ask the following questions: Why are we here? Where are we going? Which way to take to get to our destination? At first, I thought my calling was just to lead in starting and growing a congregation in Las Vegas and “Saints in Sin City” was just our community’s domain name on the web. But as we’ve gone farther into the ministry, we have to deal with believers who attend our Bible study fellowships but are already members of other churches and have no intention of leaving their churches. And we have no intention of “stealing” them from their churches either! This appears to be our usual experience whenever we start a new group. The one we started recently is no exception. Six friends of our hosts who are members of another church joined us last Thursday and even offered to host our next Bible study fellowship. It seems that God is calling me and the community I lead to minister to people who are already committed to other churches but who wish to grow with us as well. So I thought of expanding our ministry by starting a believers’ movement that would influence the city we live in—Sin City—for good. And what could be more appropriate than calling ourselves Saints in Sin City! Why are we here? Who we are should tell us why we are here. Really, we are saints. Just as believers in the New Testament were called saints (example, Ephesians 1: 1) so are we. Part of our slogan says we are “not perfect,” but as a people set apart for God’s use, sin does not characterize our lives and we have a mission to fulfill in Sin City. Our calling is similar to Jesus’ mission when the Father sent him to the world: “For God did not send his Son into the world to condemn the world, but to save the world through him” (John 3:17). We are in Sin City to proclaim that message of salvation and new life in and through Christ. Where are we going? And how do we get there? What we envision is a movement of believers that would regularly meet together in small groups for worship, prayer, study of the Word, and fellowship. Each group may be organized for outreach and other activities that would build up members and attract others to join. Each group is expected to eventually reproduce itself. The goal is not to make a small group large but for it to be a catalyst in birthing other small groups that will in turn give birth to still other small groups. With this strategy, the potential for influencing Sin City with the lifestyle of the Saints is great. But aren’t churches doing this already? Yes, they do. However, there are some church members, like those that join our groups who for some reason may feel they don’t fit in any of their churches’ existing groups. For instance, Filipino believers that go to predominantly Anglo churches may feel okay attending a worship service but may not feel comfortable joining a group. For example, they may speak English but still they have a hard time expressing themselves. In addition to providing culturally relevant small groups, we provide a place for people where they can have a deeper study of the Word. You probably heard the joke about some small group saying, “We don’t go deeper because if do we might get drowned.” Well, it’s a joke. Our goal is not just to provide a place where people can socialize and bond together (although those, too, are important), but a place where people are encouraged to understand Scriptures the way Bible teacher do—within its context and using tools that may be necessary for a more accurate interpretation and, thus, application. This implies that each small group must have a competent Bible study leader and we are planning to train some as soon as possible. Currently, our Saturday group is doing a study of the Gospel of John and some have made comments that this is their first time to study the Bible this way. In other groups, we choose Scripture passages that we feel would be most relevant to them but we study them just the same way as we study a whole book. People of the Word is the kind of culture that we would like to create among the people. For as the Apostle Paul said, “faith comes from hearing the message, and the message is heard through the word of Christ (Romans 10:17). When faith is evident in people’s lives as a result of studying and living the Word, then we believe that the Saints can make a huge difference in Sin City.